Hollywood, and West LA communities since 1938. 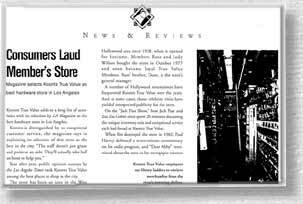 This West Hollywood landmark earned its reputation over 62 years by creating a true shopping experience. Besides its diversified hardware inventory of over 120,000 items (nearly three times that of a Home Depot), Koontz's highly trained staff of 70 employees is always eager to answer your questions. In 1982, a tragedy hit. An arsonist burned the business to the ground. Luckily, a claims adjuster had been shopping there the day before and was able to verify Koontz's claim about its staggering inventory. Nevertheless, it would be years before the legendary store would be rebuilt. This impacted the community so greatly, that talkshow host Paul Harvey dedicated seven minutes of his show to the Westside's loss. 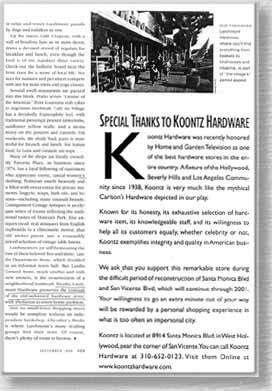 True to form, Koontz Hardware took over a nearby WWII bomb site factory and continued to provide its customers with the same customer service they had always enjoyed until 1988 when they occupied their newly rebuilt store. Southern Californians pride themselves as being hardy survivors. 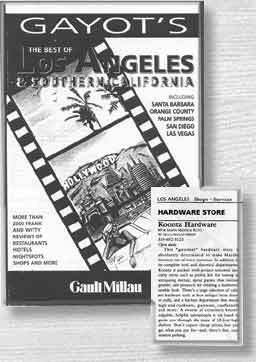 In 1994, Koontz came to their aid after the Northridge earthquake by operating the store without electricity. Using cigar boxes for cash drawers and flashlight toting clerks, they were able to sell truckloads of inventory daily as Southlanders bought supplies to rebuild their dreams.